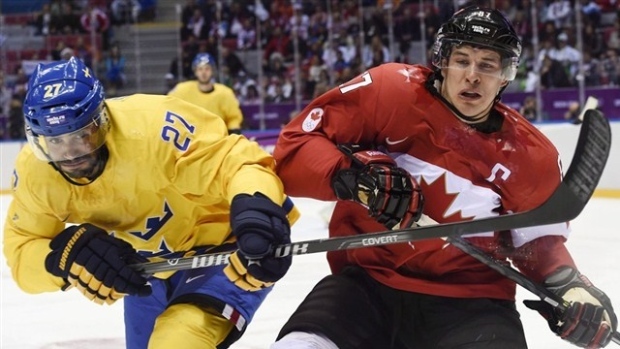 AUSTIN, Texas - NHL Deputy Commissioner Bill Daly says participation in the 2022 Olympics in China is possible but not essential to the league's efforts to grow the sport in the world's largest country. After letting them play in the previous five Olympics, the NHL said it didn't want to disrupt the midseason schedule or risk players to serious injury this year. The China games, however, could be different as the NHL eyes an untapped market of 1.4 billion people. "I'm not making any news today, I will say certainly it's a possibility," Daly said while speaking at the annual SXSW Interactive conference on a panel about the NHL's efforts to grow hockey in China. "We have (a couple) of years to kind of make that decision ... I don't think it's a critical element to our being able to grow the sport in China ... I don't think it's an essential." Daily said the NHL owners thought long and hard before deciding not to allow NHL players to compete in the Olympics in South Korea. "In South Korea, we felt ultimately there were a lot more negatives than positives than going," Daley said. "I expect we'll go through the exact same process (before 2022) ... There may be more positives to participating in Beijing." The NHL clearly has a business eye on China. The league and teams have held regular youth and coaching clinics in Shanghai, Beijing and other Chinese cities. Last September, the Los Angeles Kings and Vancouver Canucks played the league's first exhibition game in China. The NHL also has an agreement with Bloomage International Group, a Chinese-based company with a focus on developing sports in the country. "There's a lot of potential NHL fans there, a lot of potential NHL players there," Daly said. There's also competition. The Russia-based Kontinental Hockey League, has already established a professional team in China, the Kunlun Red Star, before the 2016-2017 season. "Right now China is one of, if not the, hottest markets in the world. Everyone wants to get in there," said David Proper, executive vice-president of media and international strategy for the NHL. Yet hockey still barely registers in China. According to the International Ice Hockey Federation, China has less than 12,000 registered junior players and less than 500 rinks around the country. "China is a hip market, but there is zero infrastructure," said Jessica Guo, deputy general manager for Bloomage. As host for the next Winter Games, the Chinese government is making a push to increase participation in all winter sports. The NHL has approached the government about introducing hockey-based games into middle school physical education programs, Proper said. The NHL's goal in China is to "build a permanent presence, building a hockey infrastructure, a hockey culture," Daly said. "That's not just rinks. It's equipment and coaching. Unlike other countries we've played games in, this is a new market for hockey. We realize our obligation is to build the base."